Next season, the 49ers won’t be losers anymore, experts say. But they won’t be winners, either. Las Vegas oddsmakers recently predicted how many games each NFL team will win next season. For the 49ers, the oddsmakers predicted eight wins and eight losses, which would be an improvement. 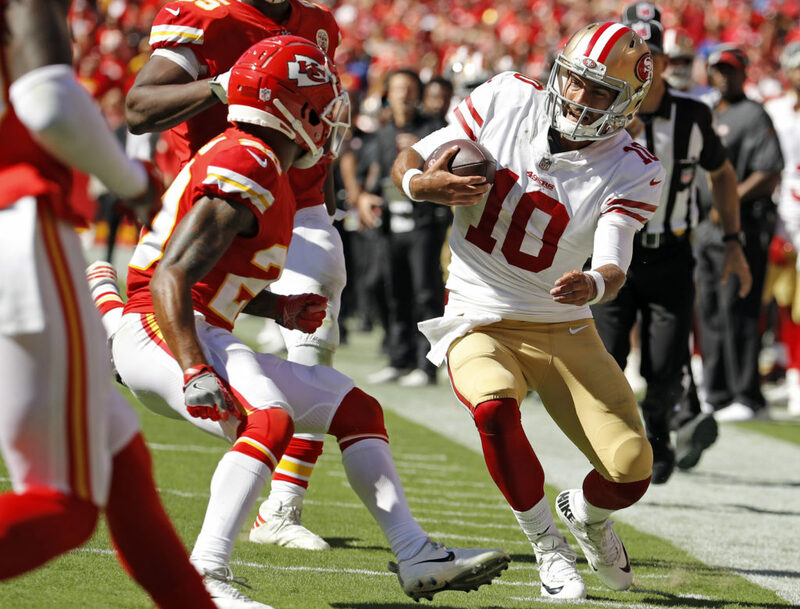 The 49ers haven’t won more than six games in a season since 2014. The NFL has not yet released the 49ers’ schedule — it will come out later this month. But the 49ers already know who their opponents will be. At home, the 49ers will play (in no particular order) the Atlanta Falcons, the Carolina Panthers, the Cleveland Browns, the Green Bay Packers, the Pittsburgh Steelers, the Arizona Cardinals, the Seattle Seahawks and the Los Angeles Rams. On the road, the 49ers will play the Baltimore Ravens, the Cincinnati Bengals, the New Orleans Saints, the Tampa Bay Buccaneers, the Washington Redskins, the Cardinals, the Seahawks and the Rams. Of those 16 games, here are eight which oddsmakers probably expect the 49ers to win. The Panthers aren’t the only team to have ran their running back into the ground. LA did the same thing with Gurley, but the Ramifications were much more apparent and significant. He now has an arthritic knee, and they aren’t the same team without him. I think we can win a late season game against the Rams, which would give us 9 wins. That’s the magic number for a franchise that’s been rebuilding, and emblematic of a playoff team…. Interesting, you think the Niners will lose at home against the Browns, Packers and Rams. I think the Browns will revert to being the Browns, especially if the Niners play them later in the season. Aaron Rodgers may also have a hard time with his rookie coaching staff. Then again, the Steelers will still be a daunting foe, because their coaching staff continuity, and overall team play against the Niners, historically. I am expecting an 8-8 season, which doubles the win total from the past season, but hope JG can lead the team to that 9th win, and a shot at the playoffs. I do think the Niners can beat Washington, because they will be intentionally tanking with Keenum, trying to get into the Tua and Herbert sweepstakes in 2020. Nah man, the Browns are going to be legitimate playoff and possibly even Super Bowl contenders this season. “Same old Browns” just doesn’t fly. The front office is completely changed, they have a real quarterback, and they are stacked with young talent all over the place. I would bet money on them making the playoffs, and once there, they have the talent to win a couple of games if things go right. Do not count out the Steelers, no matter what. They got rid of their malcontents and was a whisker away for getting in the playoffs last season. The Bungles may be the cellar dwellers, but the Ravens, with Lamar Jackson, look formidable, and could win that division. Every year, the Browns are just dripping in talent, but that does not translate into wins. I expect Baker to have a sophomore slump, and OBJ will become injured, again. Super Bowl? Tolbert, is that you? * Have you been sampling some of Seb’s medicinal herbs? I think every team is beatable for the Niners IF they are smart in the draft. They need another fast pass rusher and great WR pick and a tough CB and coverage FS. Every team the Niners play looks vulnerable to me. A powerful pass rush and the ability to rack up scores is the key. I personally would like another QB that can actually compete with Jimmy G. One with an arm. Pass rush…’and the ability to rack up scores is the key’…..True, offense. If JG or Mullens or any other QB including WR,RB,TE ect is going to excel, score, WIN and keep the QB staying upright and healthy, the ‘OL’ must be solid. ‘Every year’ they need to keep adding a blue chip/solid offensive lineman like they did in ’18 thru the draft(not a 5th to 7th rounder either) or FA, and not wait until someone gets old or leaves. Of course the Defense is very important and they need to build it up too. Niners need to trade back, and leverage that number 2 pick into at least 2 more second round picks.They should trade back a modest amount, garner picks, and still get the player they covet. Why would a team want to move up? Every team wants to move up to get the player they covet, but most fail, and miss out on a good player. In this QB driven league, getting the right QB may be the difference between winning and losing. There are at least 8 teams with sub par QBs or aging QBs. Even the Raiders may want to select a QB, although they also may be coveting Bosa. Niners are smart to advertise the fact they want to trade back. They will be even smarter if they can generate a bidding war for that number 2 pick. Sebbie… Don’t forget bundling players for win/win trades, and the value of Mullens–worth a boatload of picks in his own right, no? GEEP mentioned bundling players, too. I like it when even my detractors advocate what I have been saying for years. Glad you mentioned gaining more draft capital with Mullens, but that will not play out until the draft. If Lock is locked up by another team, and Elway misses out on the QB he covets, a Mullens trade to Denver may be feasible. I certainly know Scangarello thinks Mullens would be an excellent backup to Flacco, and if Flacco regresses, a fine starter. However, Mullens will not garner a boatload of picks. I speculated that scenario, but that was before his losses with the Bears and Rams. Flacco managed to engender a 4th round pick, so that may be in the range Mullens would produce. However, if they bundle players, maybe a second or third. The Niners have depth on the D line, WRs and secondary. Hope JL can be creative, and work well with Elway. Both teams are struggling, so a win/win trade could be feasible.If the Broncos miss out on Lock, Nick Mullens Sheldon Day and Trent Taylor may be enough to pry the second round pick from the Broncos. * LOL: Do not use me to validate your incessant mock drafts, or your blathering about bundling. * Correcting your falabilites on either doesn’t make me your detractor! I consider it a teaching moment. Cassie, just stick to the aaf, that is about your speed. He Sebbie…. More ex-AAF players being signed the last 24hrs. Are you keeping up? More couch potatoes? Dime a dozen. * Do the infirmed floss their dentures? Just a suggestion, when trying to school some one, learn to spell, first. It will make your argument stronger. Also, look up the term ‘detractor’ so you can understand where I am coming from. * You should thank me for making your day Seb. Do you feel superior now? must be proud of you? GEEP, I always feel superior to you, so you have not made my day. You made my day when you proposed bundling players to get a higher draft pick. * That’s known by medical professionals as DELUSIONS OF GRANDEUR Seb! No,that is from reading your posts. Keep trying, though. Some day, you might conjure up a thought worth 3 cents. I think GEEP is off to sniffing glue now. and bong hits. Seriously guys? Get a room! Ah Seb, methinks you mean someday. Maybe you should heed your own advice! You were holding your own until you went with your School Marm Tactics, Sebbs!!!!!!! Nobody cares about that stuff on this blog! Its about as effective as saying “you didn’t tie your shoelaces”. Who cares? And then of course, your need to get in the last word! I love it!!!!!!!!!!!!!!!! At this point in time, I doubt Mullens will garner the pick/picks that compensate for the insurance he is for the Niners. We do not yet know how long it will take JG to get up to snuff. They need a dependable Back up and it takes a while for a new QB to learn and become proficient in the Shanahan offense. I don’t trust Beathard and a new QB would not learn fast enough to be of any use this season. It’d be foolish to trade the 2nd pick with Lynch as a G.M. Your need is what Bosa or Josh Allen brings. I don’t understand why fans see how bad the Niners draft picks have been an want to give Lynch more picks to screw up. I mean he thought he’d take Thomas with the 2nd pick in 2017 an make him a D.E. How screwed up is that. Let’s take Foster an all of his Red Flags. Being a fan is one thing. But, not being able to see what works an what doesn’t, is another! They have 6 years. The # pick in 2017 should’ve been Watson. Now that’s not hindsight. If it was I would’ve said Mahomes. Lynch well never get to those 6 years. Great players don’t always make great G.M’s. And Lynch is living proof. If they trade back w/Oak, which has been mentioned a lot by many, they could still can get Allen and another 1st and 4th rd pick. Not too foolish. Saying you would of picked up Mahomes is foolish and all hindsight, why bring it up. I think a win over Green Bay is likely. Concerning the impact of the 2019 draft. For those of us who’ve been fans of NFL football over several decades, we know it’s highly unlikely that a solid draft alone immediately turns a four win (or worse) team in to an overpowering (.750 or better) juggernaut just months later. Very, very few exceptions. Niners will improve via the draft, and free agency/trades, and should fall in the 8-10 win range. One thing you can count on at this slow time of the season, is that pundits wil drastically underrate the rate of improvement or decline of a full half of the teams. The causes of uncalculated change are essentially Free Agency and injury. If you don’t lose Garoppolo, McKinnon, Taylor, Pettis, Foster(brain injury) and Tartt, the Niners are at least 8&8. Get them back and add our free agent additions and a monster DL at #2 and playoffs are in the range of possibility. The Browns Bears and Jets could make the same case. Perennial powers Pittsburgh, Green Bay, Dallas, Philadelphia could tumble downwards. Last year has precious little to do with this year. I’d like the 49ers chances of 8-8 much better if all of the games were at home. There’s a problem on the road that is more than just personnel and Kyle better have an answer soon. * Kiles elixir: A healthy JG for the 2019 season and an edge rusher in the draft! I believe that 8-8 is reasonable. If they make a splash with this years 1st pick adding to what looks to be a greatly improved front seven and can improve their CB play then it could be better than 8 wins. Its still early to make predictions (you need to wait at least until after the draft) but that being said I have a very strong feeling that the D could be really good next year. The Browns game could get ugly. Their offense, with Mayfield, OBJ, Njoku, Landry, Chubb, and maybe Hunt, will be looking at the Niners defense like a Benihana chef looks at a chunk of wagyu beef. And unless the Niners OL finally shows — after four horrible years — that it can match up with even mediocre NFL defenses, too many games this season will end in tears for Kyle & Co. If everyone stays healthy they should win ten games. Yes,even KS admitted he should have won 3 more games last season, so I am hoping the Niner coaching has improved. The loss of Zgonina and Hafley, and the addition of Kocurek and Joe Woods should not be downplayed in any way. Kocurek may finally get Thomas to be playing in his strongest position, and the addition of Dee Ford and the new draft pick will upgrade the pass rush. Joe Woods, being a former DC, will help Saleh in so many ways. I even hope Benton can put Garnett in his best position to succeed, and the whole O line improves. If the Niners can manage to trade back, they could emulate Indy, who traded back, and went from 4 wins to the playoffs. Indy also had Luck return from injury, so I hope JG can be fully healthy upon his return. Most importantly, I hope KS has learned from his mistakes, and does not repeat them. He should also look at Sean McVay’s mistakes, and learn from them. Basic coaching 101 tells a HC that he should get all the help he can get. He should delegate authority, and work as a team, with every coach doing his job. McVay did not have a clue in the SB, and was schooled by Belichick. KS needs to be more flexible, innovative and resilient. He should show 5 new wrinkles every game. He needs to make sober assessments during the game, and timely adjustments. Game management, is so critical, so KS needs to be on top of his game. No more wasting time outs. Save them for legitimate challenges, and the last 2 minutes of each half. Who knows, that might be the difference between winning and losing. I hope KS goes bold, and does not settle for FGs. The Niners do have talent, and they have so far filled all the holes in Free Agency. If JL can channel BW, and hit a grand slam in the Draft, they could be poised to win 8 games, and more if everyone stays healthy. They just need to find those contested inches, like in Any Given Sunday. And another thing Sebbie… ‘If‘ should be reproduced in its entirety on the walls of the locker room, with select passages etched on glass panels found along the concourses at Levi’s. Do not worry, I intend to present my 10 point plan on draft strategy, too. With addendum’s. * OH NO! After all the gold stars and attaboys Sebb has been pointificating about? Posts like this confirm my superiority. Cassie, you make so many mistakes, I feel sorry for you, so I do not correct them all. Actually my original sentence was’ With addendum’s for more strategic thinking. ‘ I just shortened it. When I originally typed it- addendums came up in red underline, so I assumed it need an apostrophe. I added an apostrophe, and the red underline went away. Maybe your beef is with my computer. Keep trying, though. Maybe we need an analysis from you why the aaf collapsed so quickly. You were its biggest fan. I reek of expired plankton, what’s your excuse? Sorry, the stench of Baalke even gets to me, so that is what you are smelling. To be technical (and somewhat lighthearted), the beef would be with your browser, which is what handles the spell checking function, as opposed to your computer itself. …….”Which is the side that I must go withal? IMO 49ers worst case scenario is 6-10 and best case scenario is 10-6. To get to 10 wins the 49ers could win the 8 games you suggested and they could beat the Buccaneers and Ravens. I think the Ravens take another step back from last year. I don’t really like Lamar Jackson as an NFL QB. His accuracy is absolutely atrocious so if you take away his running he has nothing. Although I have tremendous respect for Bruce Arians as a coach I don’t think Jameis Winston is the QB to lead that offense. Depends on when the 49ers catch the Bucs on the schedule. The earlier the better since the Bucs will still be learning the new offense. If the 49ers can get to 10 wins the next big question is: is that enough to get into the playoffs. I wish to respectfully disagree. Lamar Jackson is not inaccurate. He is a mobile QB who won the Heisman, so he can beat a team with his arm or legs. That Raven D is legit. Take another step back? They were in the playoffs last season. TB whupped the Niners last time they played. Who knows, TB may poach Haskins before NYG can select him. To answer your question, 10 wins generally will win a at least a wild card spot. Lamar Jackson is a flash in the pan that will get his head handed to him next year. The Ravens D is definitely good but they won’t be able to overcome all of Jackson’s give aways. The Tampa Bay game last year was an anomaly. Reuben Foster was arrested on the Saturday night before the game and released the morning of the game. It was Nick Mullens 3rd start so the Bucs had some good film on him. The defense couldn’t get to Winston and they couldn’t cover Mike Evans. The game against the Bucs next year will be much different. I like Lamar Jackson, and he is part of the new wave of mobile QBs, sweeping the league. He is also like Russel Wilson, who eludes pass rushers with ease, and can throw on the run. Now that he has taken over from Flacco, JH will be scheming the playbook towards his strengths, and better utilizing his skillsets. Believe it or not, a mobile QB can also be accurate. They are not mutually exclusive. TB was without Arians last season, and still beat the Niners. Arians knows exactly how to beat the Niners, so the talent laden Bucs will be a formidable opponent. Yes the Bucs may be different. They may draft Haskins, so they will be better. You’re right. Some mobile QB’s are accurate. Lamar Jackson couldn’t hit water if he fell out of a boat. The “talent laden” Bucs were 5-11 last year. Ryan Fitzpatrick got 2 of those wins and he’s no longer on the team. Guess we will have to agree to disagree. Lamar Jackson will do well, because JH will not force him to be only a pocket passer. I am not sold on Winston, he threw way too many picks, so if the Bucks do go with Haskins, I expect them to play much better. Yes, they won only 5 games, but the QB was the limiting factor. Another veiled homage to Kap! Who is OUT of the NFL!!!!!!!!!!!!!!!!!!!!!!!!!!!!!!!!!!!!!!!!!! Saw, Kaep is still being blackballed. I think he got bad advice. He should have completed his grievance, because that would have terminated the CBA. Your hatred of Kaep knows no bounds. To me, and millions of people, he is a hero, and should be allowed to play. Kaep is being advised and manipulated by his girlfriend who does not care if he ever plays again. She wants and needs him as a martyr and symbol for her cause. I think he always meant well but he is perfect fodder for someone like his girlfriend. She is much smarter and is easily able to manipulate him. She sabotaged him more than once before. Sadly, you may be right. like Russel Wilson, who eludes pass rushers with ease, and can throw on the run. * You mean he’s just like Johnny Manziel? Is another storm coming? No, like Deshaun Watson, Patrick Mahomes, Baker Mayfield, Kyler Murray, Tua and many others, mobile QBs will avoid the pass rushers to buy time to let the receivers get open, and also use their legs to make first downs and score TDs. Johnny Football cannot even get out of the way of a bottle of Johnny Walker. * Another Sebbi storm that’s coming, or more hot air from a bloviating buffoon? GEEP, Since you continue with the hot air, all the bloviating is coming from you. Your crazy once again, Sebs-lost in space. Wilson can hit a dot on an I from 40 yards out. Jackson is nothing like that. Still crazy after all these years…………. Ravens were 4-5, and struggling. After the bye, Flacco was benched and Lamar Jackson led them on a 6-1 run and a playoff berth. Inaccurate QBs are incapable of doing that. I don’t know; Kap played in the Super Bowl and he is widely inaccurate. Initially and until he stopped growing, Kap got a few wins, if you recall. And ‘Ol Windup is no more accurate than I am! Throwing 5 yd bullets…………………………….. Therefore, you are greatly in error!!!!!!!!!!!!!!!!!!!!!!!!!!!!!!!!!!!!!!!!!!!!!!!! Gosh, you want to rehash past history. Kaep got the Niners to the SB after starting only 10 games. He spotted the Packers a TD, then proceeded to set an NFL playoff record, running for 181 yards. He then let the Falcons build a 17 point lead before making a comeback to win and get to the SB. Some may say he was wildly inaccurate, but Kaep passed for over 300 yards in the SB, and missed glory by 5 yards. He also ran for over 50 yards, so he equaled Joe Montana’s SB record of passing for over 300 yards and running for over 50 yards. The next season, he was one pass from returning to the SB. I sure wish Jed had kept his HC instead of his GM. The Niners may have won a couple more rings. You think the 49ers will win five road games, including four in the Eastern time zone? I think it’s possible they could win 10 games and those are the 2 most winnable games out the 8 losses you picked. The other route to 10 wins I considered was a home win against the Browns and then split with the Rams. Home wins may be more realistic to get to 10 but I expect the Browns and Rams to be significantly better than the Ravens and Bucs. shows they can get it done on the road which could end up being the Achilles heel. I don’t think we can beat the Cardinals Twice. Fun Fact – The last time the 49ers beat the cardinals was on 12/28/2014. Tomsula, Kelly and Shanahan (Twice) have all been swept by the cardinals. Agree on the Packers and the Browns. Packers had a good FA and they have 4 picks in the Top 75 including 2 first rounders. So they will probably have 2 new starters and the Browns are solid. Overall I think we have 7-8 wins, with us splitting with the Rams and Seahawks. Buccaneers are a road victory. Its going to be interesting to see if JG starts the season healthy. I’m glad we have Mullens, he should be able to hold down the fort until JG can come back healthy. Who knows, if he does really well we may have a good QB problem on our hands. Either way it all comes down to health this season. I think we need a least 3 starters from this draft and a few more contributors. That’s why I think a trade back is ideal, considering the depth at edge rushers. We need a WR, interior OL (possibly Staley’s eventual replacement), DB. But I think the talent levels are finally starting to look good. But injuries is our biggest enemy. Can’t believe some morons actually fall for this…. I agree, but please stick to football. Do you think the Niners can win more than 8 games? Just a die hard faithful Niner fan, who does not want to rattle the cage, bringing out the worst in posters. I visit other sites to go political. Draft is coming up, so I hope to keep my attention on what the Niners do, to improve their team. Agree with you that Trump is a POS. Who is troll fly that came in. 1 loser. Lol triggered liberals. They’re the funny bone of this country. Can’t believe you idiots fell for this whole Russian collusion garbage. Oh wait. You voted Obama. I can believe it. Since it looks like the whole investigation by the Dems came up short, can we see some of the 30-40 mil returned to the tax payers that foot the bill? The investigation resulted in felony guilty pleas or indictments by Trump’s personal attorney, campaign manager, foreign policy advisor, national security advisor and best friend roger stone . The only reason Trump isn’t behind bars is Stone and manafort refused to cooperate. But since you are so concerned about the lost revenue, after President Beto Orourke can confiscate Trumps assets after he is found guilty of in the half dozen other investigations which are ongoing. If Beto is your top dog, you may as well gift wrap a big box of 4 more years to 45. Roll… the evidence that’s actual fact is the fake dossier that started this whole thing. Strok and pages texts weren’t enough? The illegal FISA warrants aren’t enough? There would have to be a crime for any of this to make sense. The crime came from the perpetrators who started this garbage. Again. There was no collusion. It was a 2 year investigation. And trump let him do it. Could have fired him years ago. Let it go. And start reading about uranium 1 if you want Russia collusion . Hate trump all you want. But you can’t seriously still believe that story. Good news is the ball os in his court now. And all of the illegal activities from the democrats are going to be coming out and charges will be filed. Roll with the winning team Vato. No evidence. Now back to football. Exactly! That is what that trolls intent was to begin with. To change the focus of football to divisive political discussion. Keep the subject on hand. Ninermd, valedictorian of the last and final graduating class of Trump University. How’s that degree doing for you, homie? So you and razor and all agree that the complete M. report should be released so skeptics can see how thoroughly 45 was exonerated, right? Nothing to hide, no brainer, right? Now tell this skeptic why Barr and 45 are fighting tooth and nail against that? Also tell me why those who actually wrote the report are saying what they wrote is nothing like Barr’s 3 page summary. I’ll take that as covering your eyes as to not see what’s in the M report. What are you afraid of? Ribico… maybe you missed it on CNN but Trump said it should be. Dude two years, hundreds of indictments, spying, and so on. And ZERO. Why can’t you just take the verdict from a guy and his team that hate trump? Now are they going to release all of the illegal evidence that started this? And when the report is released and again you find nothing in there. Will you vote trump 2020? Will you stop watching your liberal lying news? Will you be happy or mad there was no collusion or interence? Wait I’ll answer. I doubt it. You’ll just follow along the next piece of fake garbage they have lined up becksse you’re sooooo bitter. That’s no way to live Homie. So what’s the hold up? He, as you say, is the President, he can instruct his AG and make it it happen. Why are subpoenas needed? Why is Barr and the Justice Department fighting the release tooth and nail? 100% is because there is more, much much more, than the ZERO he and you claim. What are you and he afraid of? Just release the damn report, make me a liar. Not on a football blog–PLEASE! This is one of the few places people can go to get away from that political sewage!!!!!!!! I love Kittle’s sense of humor. Lol! Grant: My two cents worth! * The 9ers can win 6 games at home, including the Cleveland Browns and possibly the LA Rams. * 9ers make the playoffs as the wild card. If everyone is healthy, I will stand by the same record I thought they would get last year (before all the injuries): 9-7. Road wins against Cardinals, Bengals, Buccaneers, and Redskins. I’ve been saying it for weeks not to overthink it. Sure we’ve got to kill time, but when it gets too noisy; we knew all along that Nick Bosa was the pot of gold at the end of the draft rainbow…. Hmmm, so why are the Niners advertising the fact that they are amenable to a trade back? Lots of smoke, like the Giants now big indifference towards Haskins. I thought you lived in the state of California, not Denial. Razor, this is just posturing before the draft. With so many QB needy teams, and this being such a QB driven league, some team will pull the trigger on a deal to get the QB they covet. Hopefully Raider trade up for Haskins, Giants trade up for Lock, and Bosa is still there at 4. Posturing? I know what posturing is and that is not it. You want posturing? Ok. I’ll give you posturing. Klifford Kingsbury III, “Our feelings toward Josh haven’t waned or changed,” Kingsbury said. “I get that we have the first pick and there are going to be a million scenarios, and over the next three months they are going to come up. But Josh is our guy.” That, Sebber is a perfect example of pure, unadulterated posturing…. And one of the million scenarios will be selecting Kyler Murray. Then Josh will not be his guy. Then Josh will be dangled for a second round pick, or maybe a late first round pick. If the Niners were going full on for Bosa, they would not have thrown out the trade back chatter. EVERYONE is posturing. The draft is built on posturing, until a team is on the clock, then it becomes real. Sure am glad the Niners are doing their due diligence. I hope the Raiders and Giants get into a bidding war, and the Niners can pry another first round pick from one of those teams. While I would be happy if the did get Bosa, I hope they get more picks, and another good EDGE. Maybe even trade back multiple times, and still get Brian Burns. Yep, now you understand what posturing is. We all thought the Niners were going to take a pass rusher in 2018, but they fooled everyone, and chose McGlinchey. If you read that article that states the Niners will select Bosa, it also mentions that Kocurek may not want Bosa, if they scheme wide 9 a lot. In my Brooklyn accent, first of all McGlinchey wasn’t a surprise pick at all if you didn’t overthink it like I did. My gut said they were finished with Brown, but my brain thought too much. McGlinchey made complete and total sense after they made the pick, just like Bosa will when they take him. He fits Kocurek’s wide 9, in my Ace Ventura voice; like a glove…. Kocurek may want an EDGE player with 4.41 forty speed, over a 4.87 speed guy. Nope, he wants Bosa. Best edge rusher in the draft bar none. Don’t overthink it again, and believe Kingsbury is just posturing. He’s probably telling the truth too saying Josh is their guy. They may want to recoup some picks they gave up trading up for Josh last year, not giving him a chance basically after only one frickin year.. and trade #1 with Gruden for Oak’s #4,27,35, same value as #1. They need DL bad, maybe Bosa or QW. Murray was a 2nd rounder months ago when everybody said he was 5’9′ 190, then shows up at the combine at 5’10 and an overweight 205 and didn’t want to run a slower 40 yd dash. Then ALL of a sudden he’s number 1 dog, lol. Which NFL team has ever traded up to draft a 10 ten pick QB in the 1st round and then the following year drafted another top 10 QB with their #1 pick, back to back years. Azi trades their #1 pick or takes Bosa, Josh is their guy. Josh Rosen had a QBR of 66.7, a total QBR of 26.1, and a PFF grade of 49.1. He is expendable, and there are many QBs who could be an upgrade, like Kyler Murray. Then, they could trade away Rosen to a QB needy team, and get a high draft pick. I think they realized that Rosen was not the answer, so it makes sense to try to find a QB this season unless they plan on tanking this year. I doubt they have the same time slack that Shannahan’Lynch were given. They have to produce this coming year or they might get the ax. With Rosen that might not be possible. It’s not just about his skill level but his attitude as was on display after he dropped in the draft last season. Yup. Rosen was thrown to the wolves and got the Alex Smith treatment instead of the Aaron Rodgers treatment. It showed by the numbers of sacks and his slow processing skills. Rosen constantly threw late, so his receivers were blown up. Maybe he could have benefited by sitting studying, and working out to get stronger, but he ended up shell shocked, which slowed him down even more. Josh is a first year QB, patience….They just might trade #1 and get great 1st round picks plus more instead of getting another QB that’s 5’10”. or Bosa, they need D too!! Rosen is a freaking statue in the pocket, and that just won’t do under Kingsbury rules, no matter how much posturing is done. Josh is their guy….no #1 pick for a dinky qb when they traded picks last year to get up into the top 10 for Josh. He gets another year or two. And they can make a killing traded #1 this year. They also need a DE, maybe they take Bosa. For Seb, and Cassie Baalke, who entralled this blog with their weekly AAF travails. Thank you both for the memories. I know you both will keep a stiff upper lip and commiserate together to convalesce. I, myself, could never support such a quacksalver. I leave you both this item from the folding league. Perhaps your love for it will find you both raising donations for those players, out-of-pocket on their hotel bills. In five years these AAF bosses who left players holding the bill for hotels/travel/injuries will be talking about how proud they are of AAF alumni accomplishments in the NFL and no one will bat an eye. Check the archives… I never held the AAF up as a model of stability or efficiency. My point is and always has been about the idea of a development league–a good idea needing work. My other point is (and always was) that a number of players on AAF rosters would be signed in the off season/preseason–and that is happening. Do not blame me. Cassie was the biggest booster on this site, crowing about packed stadiums and dithering about the playoffs. I was skeptical from the start, and was proven right. Check the archives Sebbie… Player development and getting players reps so they can compete. You went off the deep end so I had some fun poking you with AAF material. Never did I say the AAF was a mature, stable enterprise. No, you will have to eat crow. You touted the aaf like it was the next best thing to sliced bread. Packed stadiums were your mantra. Cassie Baalke, the aaf cheerleader. Lots of crowing, now trying to do a 180, but we all know what she wrote. Cassie’s football knowledge is on the level of the aaf. Devoid of talent and bankrupt thinking. 49ers tapping into the AAF – sign Damontre Moore. Camp fodder. Gotta have it. Looking forward to Grant’s reporting on how the training has changed under the new strength & health management unit…. A good example of what some saw as value in the AAF–giving players ‘extra’ reps to improve their craft and get another shot on a NFL roster. Moore played reasonably well for San Diego. His combine testing helps explain some of why he never did much in the NFL. Decent broad jump and vertical jump; not so may reps and not terribly fast. Hoping he has a competitive camp–will make others better if he does. Would be interesting to discover which player had the worst combine performance of his position group (over an eleven year period), yet has had a Pro Bowl+ career. Conversely, which player had the best combine performance of his position group, and was out of the league within two-three years of being drafted. Look at the period 2002-2012. Is Bosa a foregone conclusion ? Just about every public mock has us picking him. I predict 11 wins and wildcard birth. Who is the highest-rated Stanford player in the draft? Maybe Lynch will trade down to get him. The Bosa Constrictor’s quads look like they swallowed baby rams whole. Yes he will be the pick. 100% guaranteed. But does he have calves the size of cantaloupes? If so, keep it a secret from certain Congressmen. You mean like on that insurance commercial?